As one of the UK’s leading door mat distributors we have a large and exciting range of door mats and entrance mats ranging from budget doormats to heavy duty industrial door mats. Our machine washable door mat range offers a selection of easy care door mats which are great for domestic, commercial and industrial premises. As well as offering indoor door mats we also have a selection of exterior outdoor doormats including scraper action door mats and open top exterior door mats. There is much information about door mats across the Internet some of which is accurate and some, well, not so much. We always endeavour to provide the best door mat information available anywhere. One of the main things to consider when you are deciding on a door mat is how much traffic will be walking across it. Obviously the more foot traffic that will cross the mat the more robust it needs to be. First of all we will talk about door mat construction and in particular the type of material used as the door mat backing. Broadly speaking there are two types of material used for backing doormats, vinyl and rubber. Vinyl offers a lower cost solution and rubber whilst more expensive offer a more robust solution. Vinyl backings come in various qualities. On most cheaper door mats a low grade vinyl is used and this can present problems as it can become rigid and brittle in cold temperatures. This can then lead to the door mat not lying flat on the floor and can also lead to the doormat edging cracking. Higher quality vinyl reduces this but does not eradicate the problem entirely. 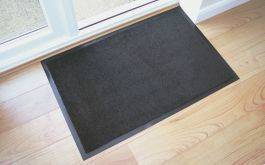 All of our vinyl backed door mats use a good quality vinyl which helps to minimise any potential problems. Rubber backing is much more flexible and hard wearing. This type of door mat backing provides more traction which means that the door mat will potentially slip less on hard floors than a vinyl backed mat. Rubber backing can also be cleated, this means that there are lots of raised ‘bobbles’ on the back of the door mat and this can help the mat grip carpeted areas, again resulting in less movement than a smooth backed door mat. Once you have decided on a suitable backing for your intended doormat you will then need to decide which type of pile construction would be most suitable. The two door mat pile types we will talk about here are cotton and nylon. Both have their advantages. Cotton doormats are extremely absorbent and are better at removing moisture from foot traffic. Cotton being very absorbent means that the door mat will have a blotting effect and will remove moisture just by contact even if feet are not wiped. 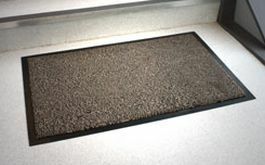 Cotton door mats are particularly favoured in pet owning households as the door mat will remove moisture from dogs and cats paws as they walk across the mat. Nylon is the most widely used material in door mat construction. It has a dirt trapper action and is effective at removing mud, dirt grit and moisture from shoes and boots. 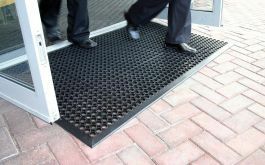 In addition it is incredibly hard wearing making it suitable for door mats intended for use in high traffic commercial and industrial situations. If you require any advice about which door mat to select then please contact us and we will be delighted to help. What is the best type of Door Mat? This is not the easiest question to answer as which door mat is best depends on several factors such as the type of floor it is to be placed upon and the level of foot traffic etc. What is the best type of Door Mat Backing? Rubber is considered the best type of backing and it is hard wearing and provides more grip than a vinyl back. In addition rubber backings can be cleated to enable more grip on carpeted floors. Can I put my door mat in a washing machine? Many door mats can be machine washed, however this very much depends on the type of pile and backing. We offer a range of machine washable door mats. Can I have a door mat made to a specific shape? Yes you can. We manufacture a range of door mats that can be made to custom shapes and sizes. Can I have a door mat made to be inset in to a floor? Yes you can. We manufacture a range of door mats that can be inset flush with the floor, these are known as mat well door mats. Where can I get more advice on which door mat would be best for my requirements? As door mat specialists we can offer all the help and advice you require and would be only to pleased to assist. Please contact us.